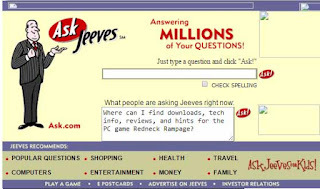 Ask Jeeves, now Ask.com, started in 1996 and had a broad market share at the beginning of 2000, particularly in the USA and Great Britain. Offers in other languages followed, e.g. a German version in 2006. 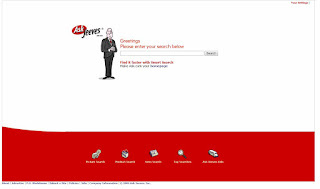 The main idea was to offer a question and answer search. The user can ask a question and a team of almost 100 people offered websites matching the most frequently asked questions. 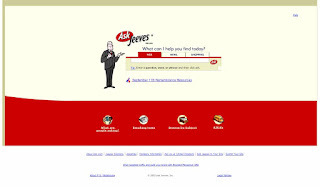 Over time, the database grew, and at the same time the answers became less relevant. So they began to integrate search engines: First they used Dogpile and About.com and later they bought Direct Hit (2000) and Teoma (2001). 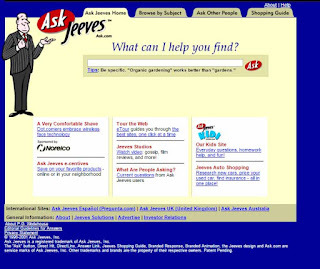 In 2006 Asked Jeeves was renamed Ask.com, but for the UK site Ask Jeeves has been back since 2009.